Tick believes tracking time at a granular level is too tedious to be productive, but we understand that in some situations tracking at a To-do item level can be helpful. 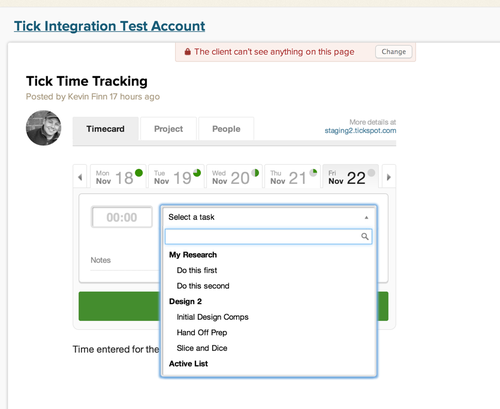 Up to this point, Tick has only supported automatically creating tasks from a Basecamp To-Do list. 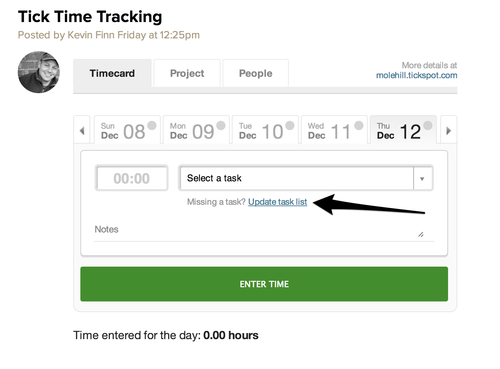 But with this update, Tick gives the option to automatically create tasks from either To-Do lists or To-Do items. A few months ago, Basecamp released an update that gave users control over discussion visibility. With Tick, the client has never been able to see the actual Tick app integration, but there wasn’t a way to hide the discussion from the client. With this new update, Tick automatically posts new “Tick Time Tracking” discussions as private if client access is turned on in Basecamp for that project. To hide Tick discussions that were posted before this release. Please delete the discussion in Basecamp, then jump over to Tick and force an update to the project. 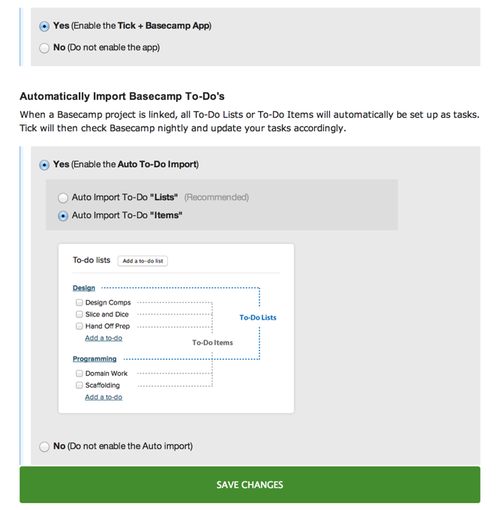 The final update in today’s release out is a new feel and added functionality to the Tick time app itself in Basecamp. 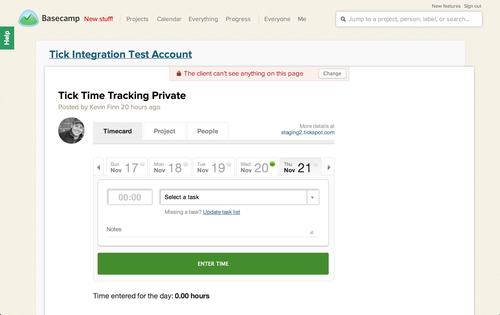 This change brings the new look of Tick’s Timecard into the Basecamp integration. If you’ve chosen to track time at a To-Do level, selecting the To-Do in the app works similarly to the timecard in Tick - start typing the To-Do list name, then select the To- Do. The top navigation has also changed to allow users to see where the budget stands by task under “Projects,” and gives admins the ability to see who’s added time to a project. This is one of the biggest changes we’ve rolled out for the integration since the new Basecamp came out, so we’re pretty excited. Let us know what you think or, if you have any questions, ask the wonderful people on our support team!